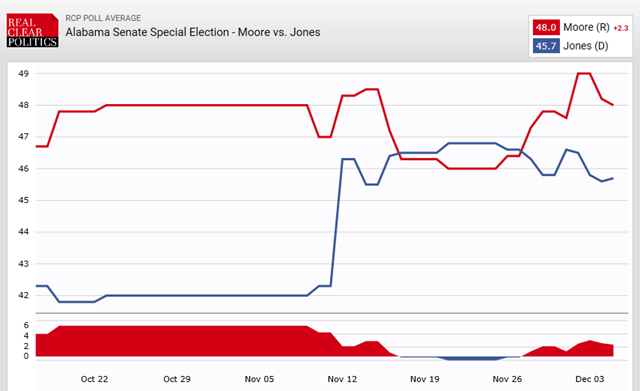 1) Surprising (to me), Moore didn’t dip all that much when the accusations against him were reported … he only dropped about 2-1/2 points from his polling peak. 2) Jones did get about a 5 point bounce and appears to be holding in the 46% range. 3) Moore bounced back … more than recouping his drop … to reach a new peak … just short of the magic 50% mark. My bet is that Moore is leading by an even larger margin. A modern day “Bradley Effect” … call it the Trump Polling Effect. Trump-supporters were reportedly hesitant to voice their intentions … especially to a stranger on the phone. My hunch: same dynamic is in play with Roy Moore … folks being reluctant to tell a stranger that they were planning to vote for a creepy old man. So, odds are that Moore’s numbers are understated. How can Alabama voters possibly be on the Moore bandwagon? I think the explanation is quite simple. Many people are probably suspicious of the accusations … since they are decades old … the strongest hard evidence – the year book signature – has been debunked … the most recent WaPo smoking gun is a graduation card saying “Best Wishes” … and there’s a muddling of all the sexual harassment stories floating around these days. It’s hard to keep the players straight. More fundamentally, nobody seems to be claiming that – even if the old accusations are true – that Moore is still on the prowl. Maybe he’s turned over a new leaf … or too damn old to be a threat. On the other hand, his Dem rival has staked out a pretty hard line abortion position. Though liberals probably find it incomprehensible, some Alabama voters may think that abortion (today) is worse than trying to hit on teenage girls (40 years ago). This entry was posted on December 6, 2017 at 6:59 am and is filed under Politics, Polls & Surveys. You can follow any responses to this entry through the RSS 2.0 feed. You can leave a response, or trackback from your own site. How many people know that when the “creepy old man” was doing whatever he was doing back then – he was a Democrat?